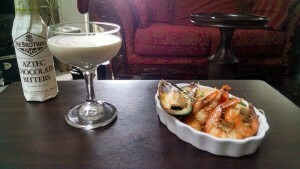 The Distracted Hermit Martinis. Food. Culture. A Table for One. Results for category "On the Town"
We had a seriously trying, “defining moment” type of day, and we ordered at Gordon Biersch like we’d never eat again. We watched a movie at the best theatre and I bought new boots. Don’t let anyone tell you such activities are not cathartic. They’re lying. First things first. Keep in mind, this is a full brew pub with I’m sure some interesting brews on the menu. But it wasn’t that kind of day. I needed it straight, with no nonsense. 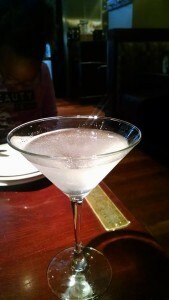 I ordered a clean gin martini, no garnish. I’ve developed a distrust of restaurant olives, as they tend to be the worst kind, with a low quality, over-the-top brine and garish pimentos. It came in a bird bath-sized glass, but in this era, that cannot be helped. I was a bit suspicious of the “frostiness” of the martini when it arrived, but I discovered to my delight that this was a perfect, finely shaved iced that disappeared within the first two minutes of drinking, leaving the ideal, ice-cold martini. Very well done. I had two. 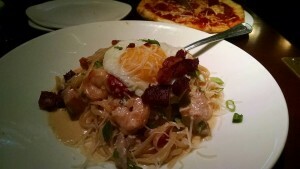 The meal itself was exquisite: shrimp and salmon carbonara with fried pancetta and topped with a fried egg. The perfect meal for an extremely stressful day. I usually turn down dessert since I expect to come home with leftovers, but what the hell. Rich fudge, but not so rich as to make you feel like you’re being taught a lesson. Overall, the finest experience I’ve had in a long time, including the service. I can’t believe how many times I’ve walked into the movie theatre at Flatirons and only casually glanced at this restaurant. So if you find yourself in the Denver Metro Area, or one of the other rare locations of Gordon Biersch, I thoroughly recommend you drop in. Bourbon Cream Cocktail. Chinese Take-Out Buffet. Bourbon cream cocktail with chocolate bitters, along with some nibbles from my favorite Chinese buffet. Back to video games. Until further notice that’s my after-work status: video games. I actually get to play them so rarely that this is an exotic indulgence by my standards.